Girl Charlee Fabrics UK & Europe: Tutorial Tuesday: Peplum Dress by Rumana (The Little Pomegranate) & Giveaway! 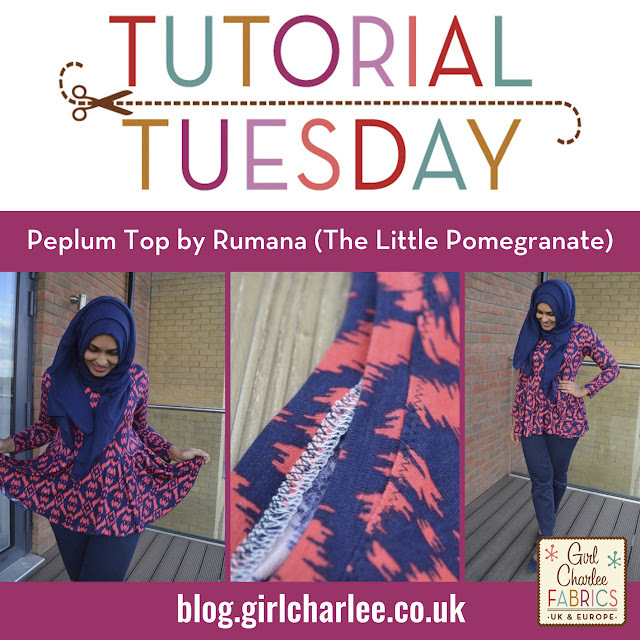 Tutorial Tuesday: Peplum Dress by Rumana (The Little Pomegranate) & Giveaway! This is a really versatile style that is flattering for all shapes- you can move the peplum up to create a high-waisted top, or drop the peplum much lower to create a trendy drop waist top/dress. You can shorten the peplum, lengthen the peplum, or as I’ve done in the past, make it high-low. Really the options are endless! - Stretch fabric: approx. 1.5m (S-M sizes), 1.8-2m (larger sizes). Note: you’ll need more if you want to make a longer peplum. 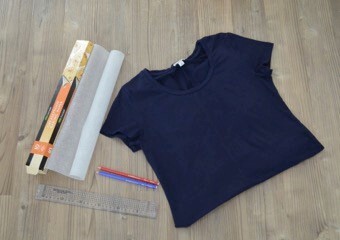 - A nice fitting t-shirt/vest top which needs to be stretch fabric. 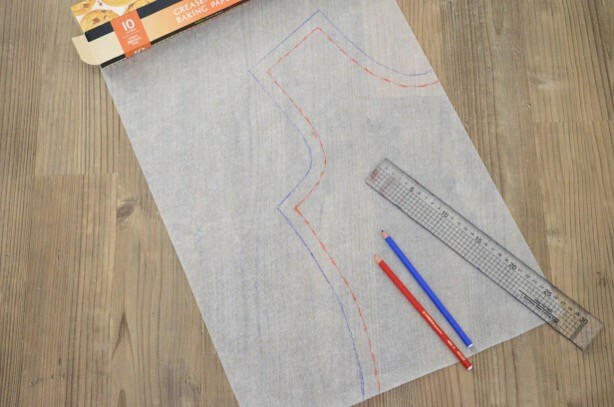 - Paper to trace a pattern onto (if I don’t have pattern paper to hand I just use some baking paper). 1. 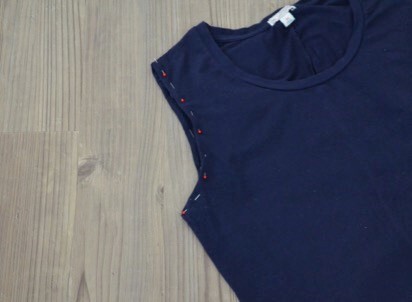 If using a t-shirt with sleeves, tuck the sleeves in and pin out of the way of the armhole. You’ll see that the front armhole has a deeper curve than the back armhole. 3. 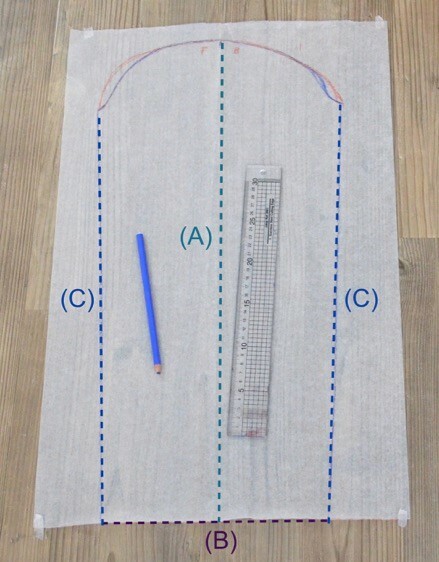 Go around the shape you just traced with a 1.5cm margin (in blue). This will be your seam allowance. 4. Repeat for the back. Note: this is a quick way to create a sleeved top and works for stretch as it’s quite forgiving but isn’t the ‘proper’ way to draft sleeves. 5. 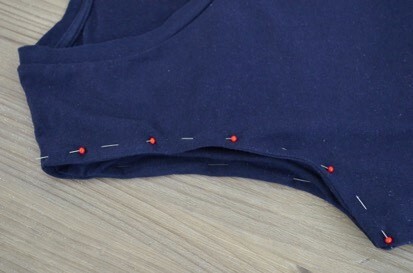 Line up the shoulder seams (in the red) for both pieces and temporarily stick together using pins/masking tape. 7. 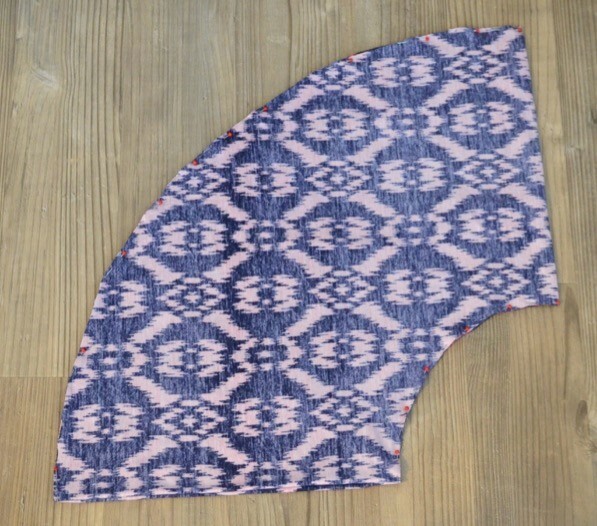 Curve out the sleeve cap to make it look like a pattern piece (in blue) with a bell shape. You can use a French curve or even a dinner plate to help you with this. 8. 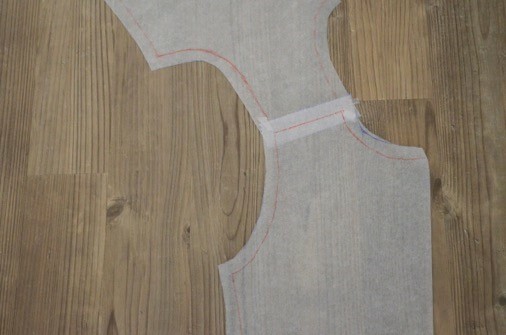 Fold your piece in half with the corners of the sleeve cap matching and use this as your centre line. 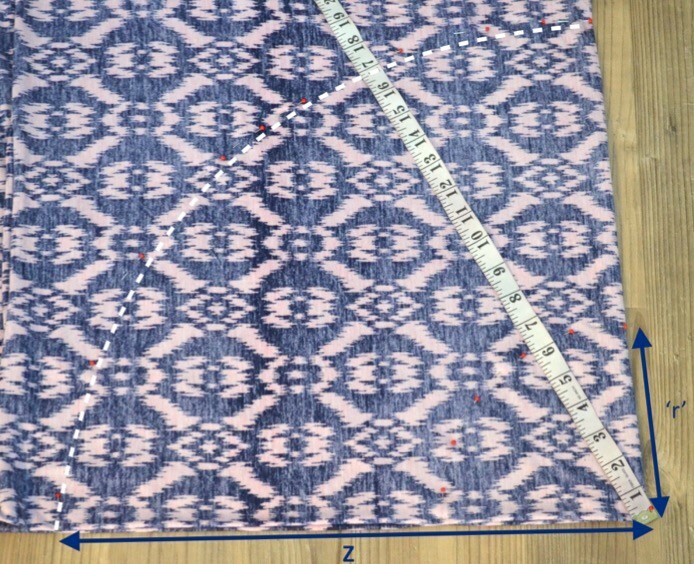 Decide on the length of sleeve you want plus 1.5cm and measure this length down the centre line (A). Measure how wide you want the sleeve cuff to be by loosely wrapping the measuring tape around your wrist = Cuff size. Add in line B as shown making sure line A intersects in the middle if B. 9. 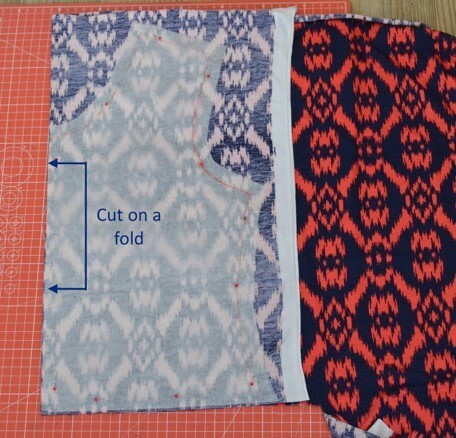 Cut out your pattern pieces, the front and back bodice should be cut on the fold. Remember to notch the centre parts for the neckline (back and front) and the shoulder seam notch on the sleeve cap. 10. 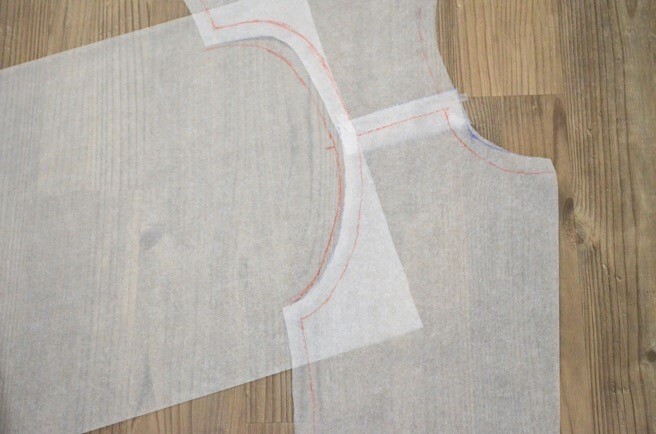 Add a strip of stabiliser/ribbon over the back shoulder seam to stop the shoulders from distorting/stretching. I did this just within the seam allowance, overlapping where the stitching will go. 11. 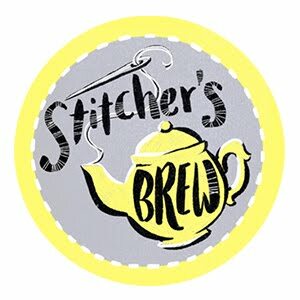 Stitch the shoulder seams. 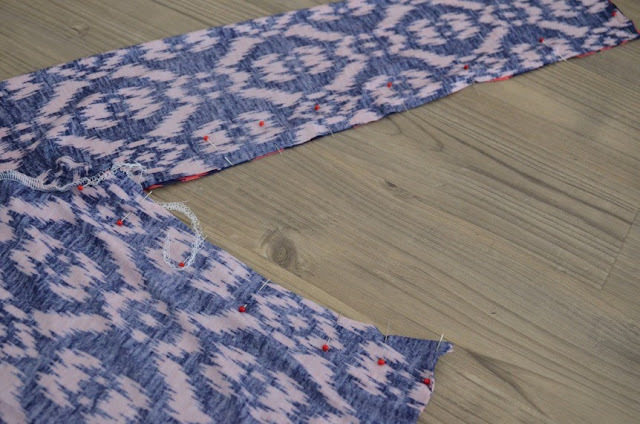 You can use an overlocker or normal sewing machine with a small zig-zag stitch. 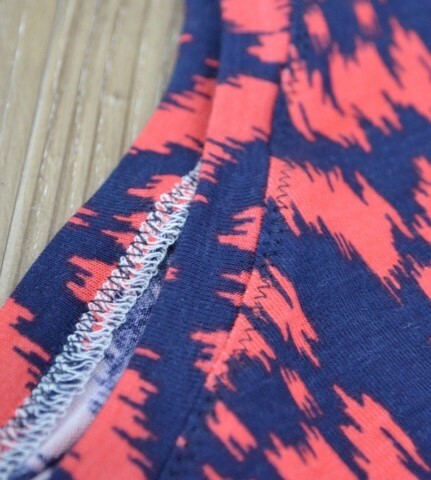 Press the seam towards the back. 12. 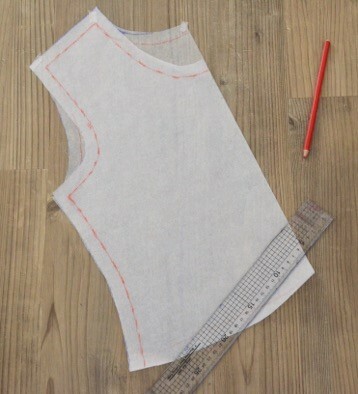 Spread open at the shoulders and pin the sleeves in place, matching up the corners and the shoulder seam notch. 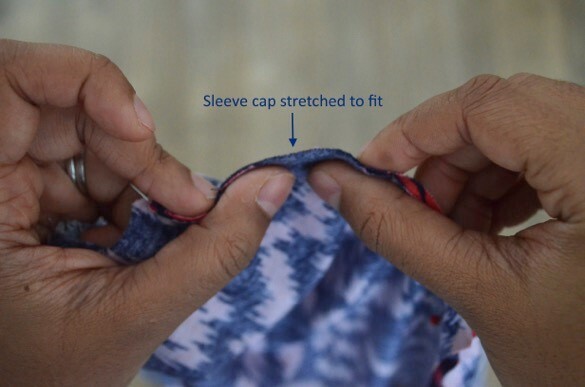 You will need to stretch the sleeve cap into the armhole fit to properly. Make sure you stretch it evenly throughout the cap. I find it’s easier to ‘push’ the fabric into the gaps with my thumbs as I go along. 13. Stitch sleeves in and press the seams towards the body. 14. Pin along the side seams and stitch along the sides. 15. 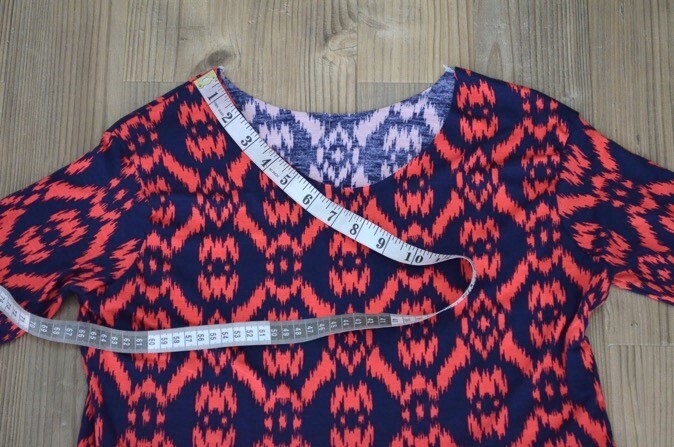 Measure around the neckline, being very careful not to stretch it as you do. Take this number e.g. 54cm and multiply by 0.9. 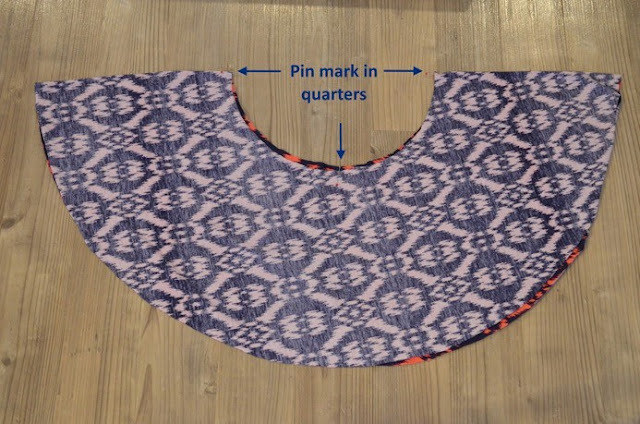 Then add 3cm: this will give you the length of the neckband including seam allowance (L). 16. 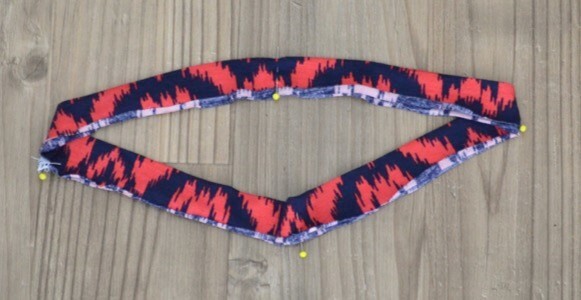 Cut a rectangle of fabric to create the neckband, fold in half, pin and stitch to make a continuous circle. 18. 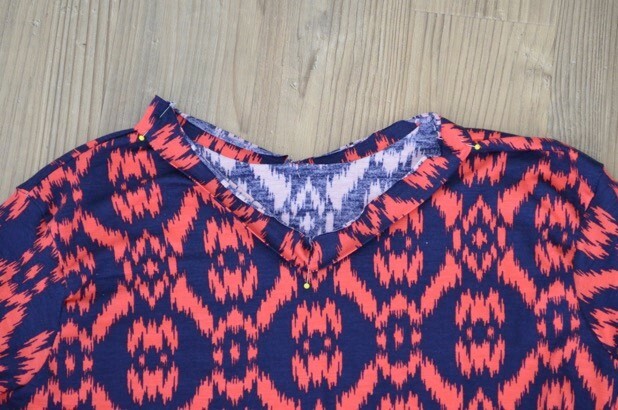 Pin to the neckline with the raw edges meeting. 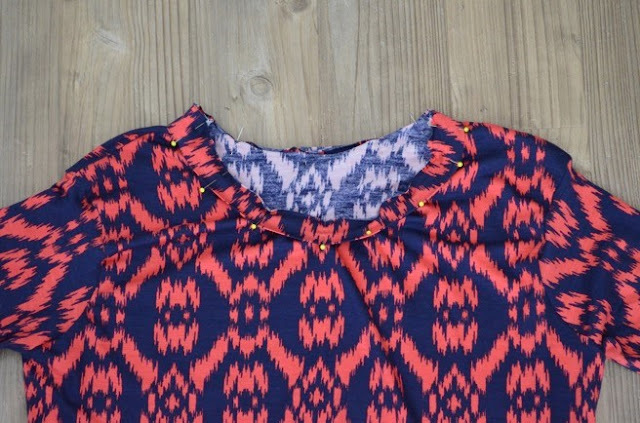 Match the quarter pins with the shoulder seams and the centre notches of the front and back neckline. 19. 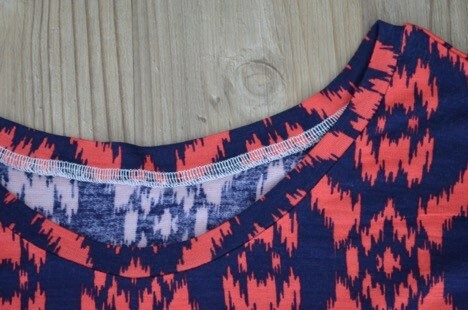 Stretch and pin evenly all the way around the neckline and stitch into place. 20. Press the seam allowances downwards. 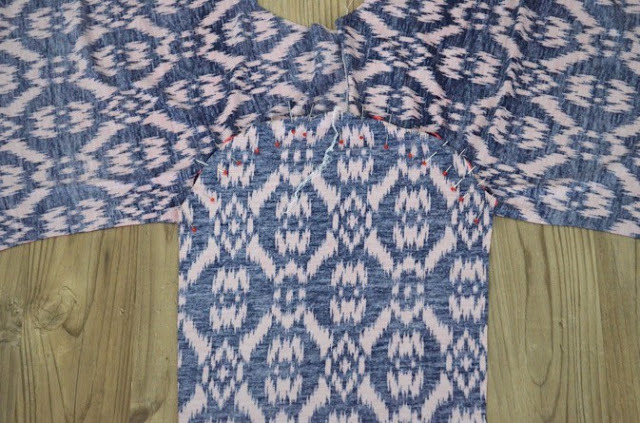 You can then stitch into place using a twin needle or zig-zag stitch. 21. 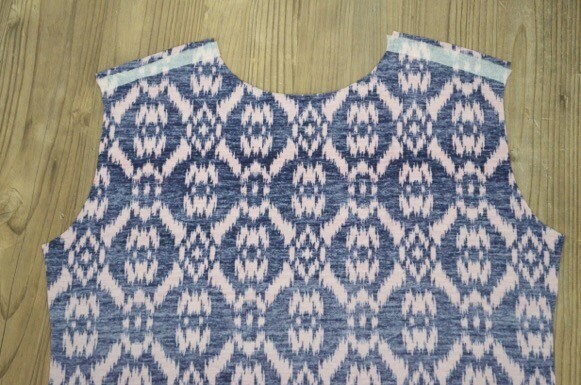 Fold and hem the sleeves. 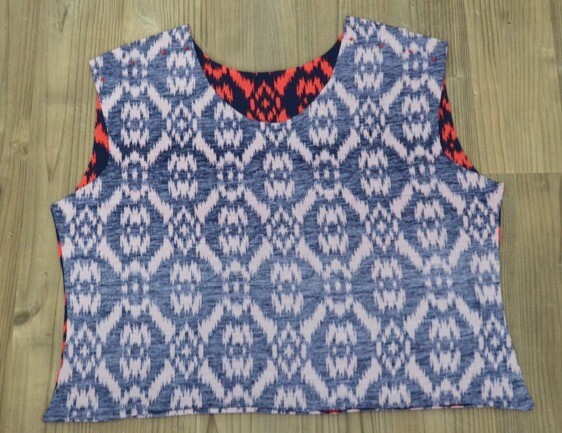 The main top is done, just need to add the peplum! Back to some simple maths! ‘r’ is your radius. Start from the top corner of the folded fabric and pin mark ‘r’ distance along to create a curve. In my picture I pinned at 6inches and moved the tape along, keeping it fixed at the corner to use the tape as a compass. 23. The second curve will be the depth of your peplum. 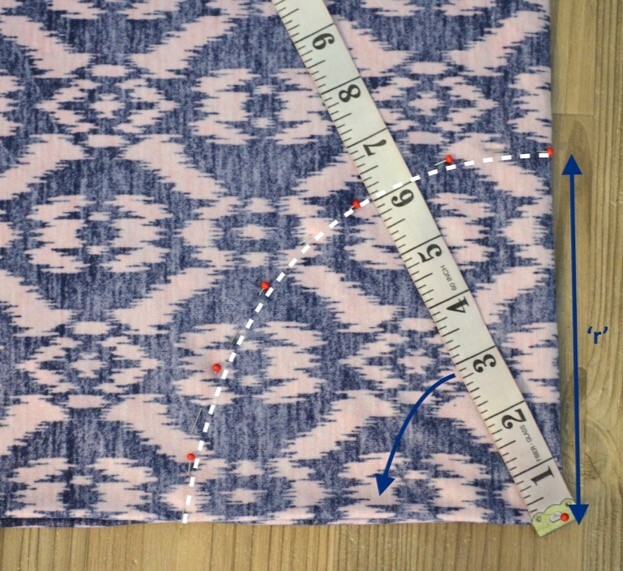 Decide on a depth for your peplum, Y.
Repeat the above, keeping the tape measure fixed at the corner and pin mark along length Z. In the photo mine is pinned at 17inches. 24. Cut along the pins. 25. Pin mark at quarters again. Match these to the bottom of the top, side seams and centre front and back. 26. Pin the peplum to top, right sides together and stitch. Press the seam allowance up towards the top. 27. Hem the peplum, shortening if desired. 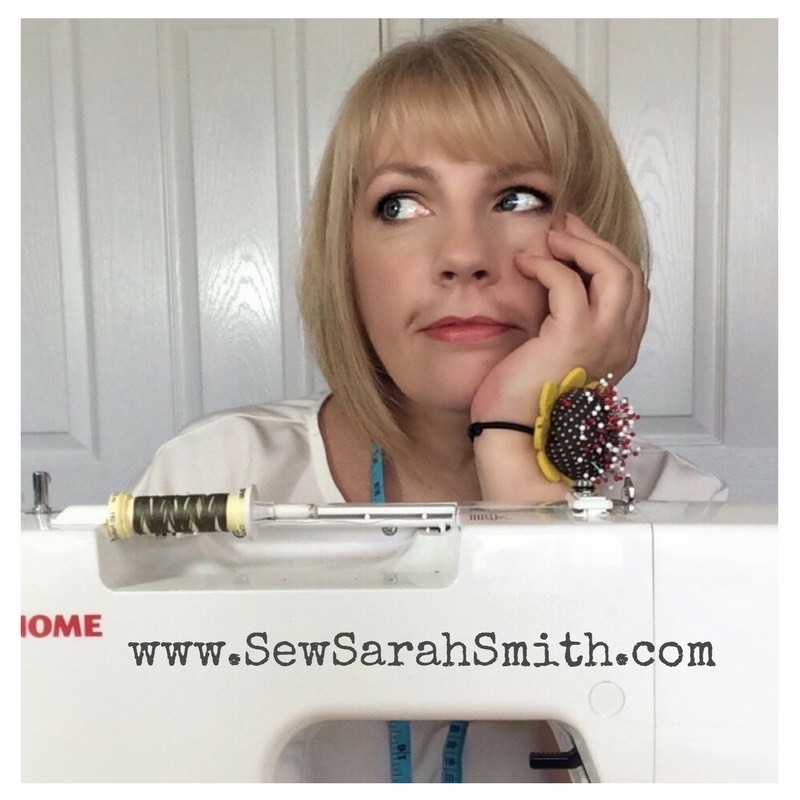 I did a rolled hem with my overlocker but there are plenty of other ways to do it. If you’re new to stretch you might want to avoid doing a curved hem- and luckily stretch doesn’t fray so you can leave it raw! Depending on the look you want you may want to do a narrow double or single fold hem. Phew. That was a long one! It really is simpler than it sounds on paper! Hopefully the photos help you along. Remember the options are endless. 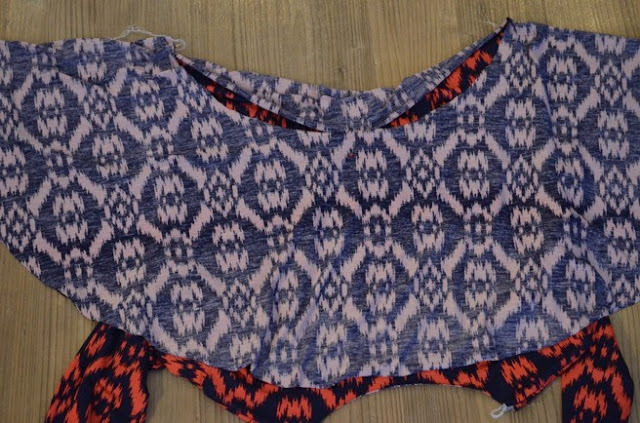 Pair with trouser, or a skirt, or even make it into a dress! Also don’t forget to enter the fabric giveaway (see below) and tag any makes with #girlcharleeuk and #thelittlepomegranate so we can have a look at how you get along. 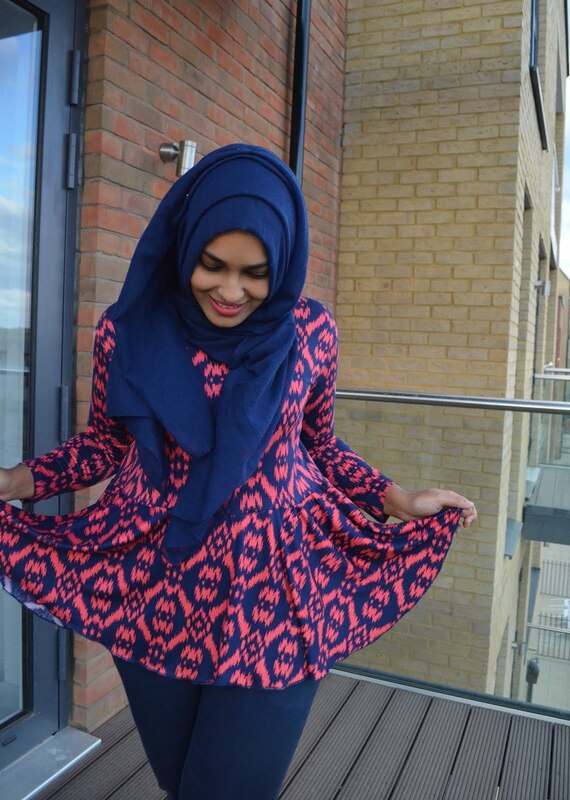 Thanks Rumana, the top looks amazing! Rumana is hosting a giveaway for 2 metres of our lovely fabric for one lucky reader so you can make your own peplum top or whatever you like! 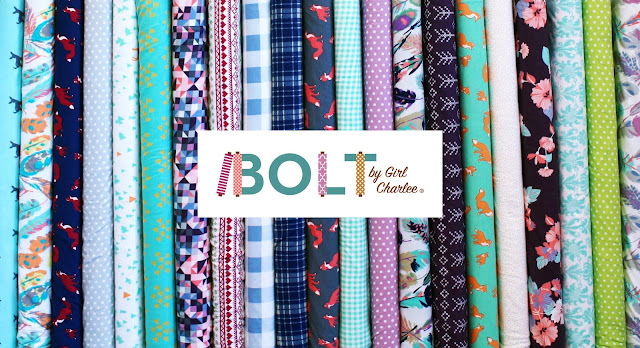 If you haven't tried our new BOLT by Girl Charlee range, this is the perfect opportunity! BOLT by Girl Charlee is a range of 28 designs with co-ordinating colour stories across 4 collections. 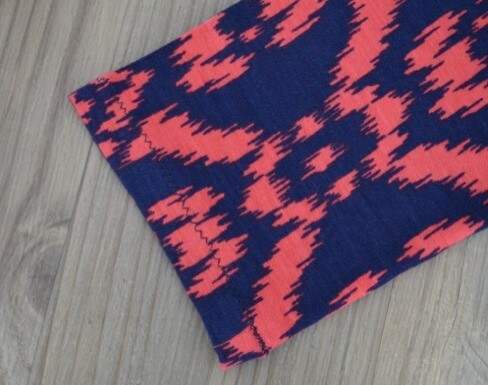 Made in the USA from the softest combed cotton with 5% Lycra for stretch, these high quality knit fabrics are perfect for dresses, tops, leggings, baby clothes, shorts and more! See the full range here. To enter, the giveaway, simply sign up for our newsletter (you can sign up here), then post a comment on Rumana's blog - The Little Pomegranate. 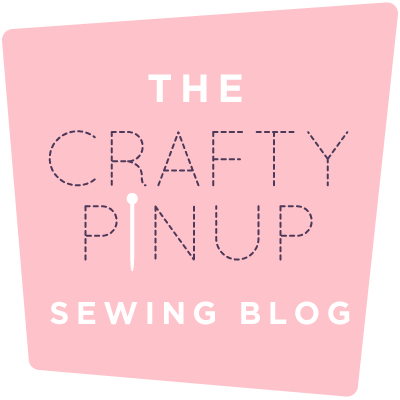 If you are already signed up for our newsletter, just add a comment on her blog! One winner will be picked at random on 1st November. One entry per person. Eligible entries must be signed up to the Girl Charlee Newsletter & have commented on The Little Pomegranate blog. 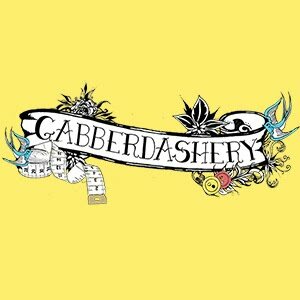 Competition open to anyone in Europe. 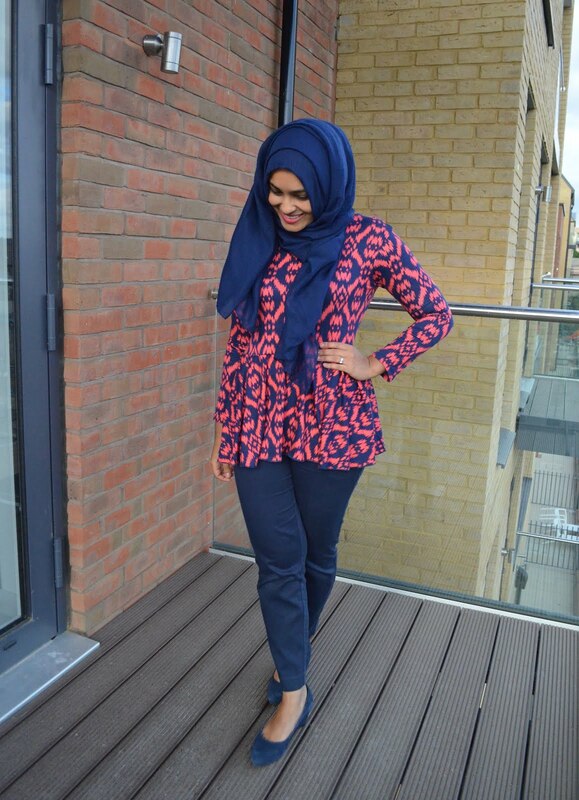 Love this peplum top. 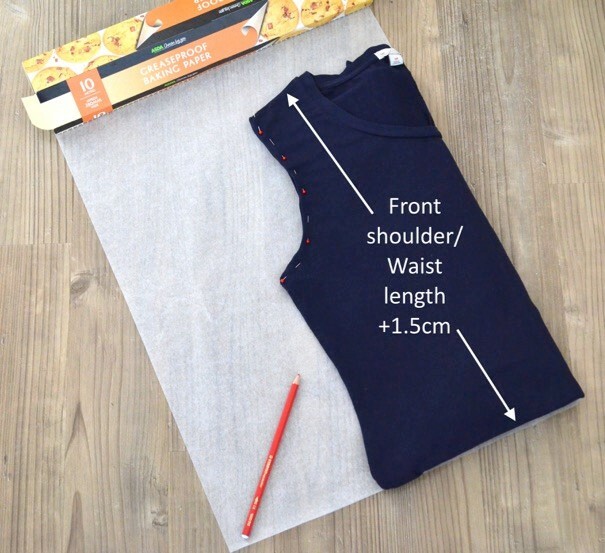 Thank you so much for demystifying how to draft a pattern from an existing T-shirt. 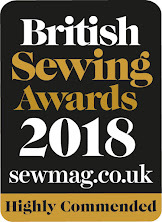 Only problem now will be to decide which of the lovely new Bolt fabrics to make it in.